Not a fan of this. Very boring. It's alright but not as good as SOTR & LIHB, 3.5. Great song from Good Charlotte. Offers absolutely nothing new, not even the clip can save this one. TRASH! This is how I like my Good Charlotte - quality pop rock. With just the right amount of tongue in cheek delivery. A fun little ditty. 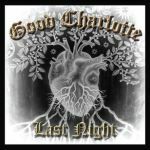 Good Charlotte continues in the 'rock' direction.<br><br>Peaked at #17 on my personal chart.<br><br>Came in at #88 on my TOP 200 OF 2011. Pretty good but the previous two singles are better. Good Track. Best from the 2010-11 Good Charlotte releases.